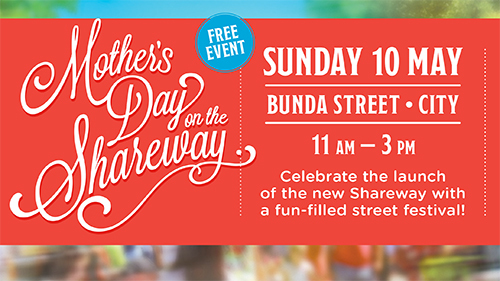 This Mother’s Day, Bunda Street is hosting a free event for the community. Make this Mother’s Day one to remember at a fun-filled street festival for all mothers, and those who love them, with entertainment and activities for everyone! For more information, visit the TAMs website. Don’t get run over. I don’t think the motor vehicle drivers using “The Shareway” have quite got the message yet….